First of all, I think my title sounds weird. Perhaps when you see this Valentine's nail art, you'll be able to understand why I think so. A month of 2013 has gone by so fast! It is officially the month of love! 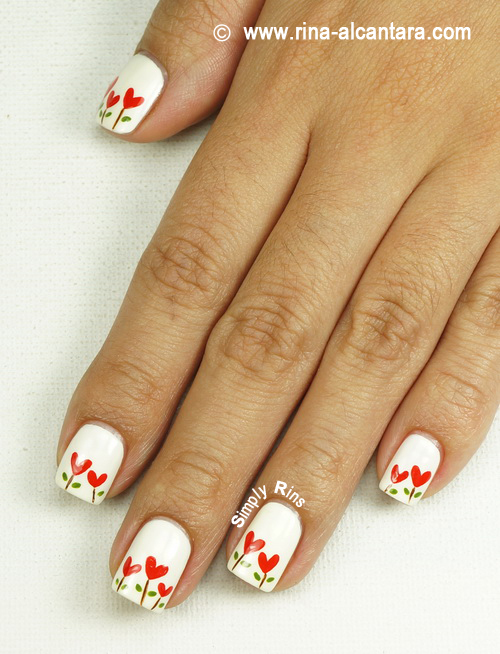 I am quite sure that a lot of women all over the world will be celebrating Valentine's with a fabulous nail art design. Single or unattached, it really doesn't matter. I think that Valentine's is a celebration of love ... in any way. This is actually in response to an email request to come up with something simple and easy to do. And I hope I was able to achieve that. My idea was to use hearts and paint them like flowers. The heart shapes were kept relatively small to make painting them easier. 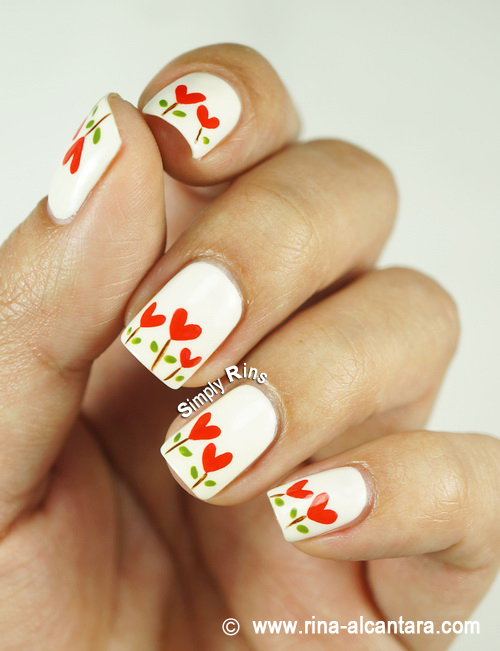 Just load the nail art brush with a good amount of paint and draw a "V" to create the hearts. For base, I wanted something white to highlight the red hearts. I used 3 thin coats of Dazzle Dry Linen Lace for full coverage. I really love this shade. It is a sheer white polish with yellow undertones. I hand painted the design using acrylic paints and nail art brushes (detailing and stripper). A good alternative is to paint them at random places. I can imagine how interesting that would look. I hope you liked this Valentine's nail art design. Have you decided how you'd be wearing your nails on the 14th? I love this!! They're so cute! Beautiful base colour, I like the fact that you didn't choose white base. I like your flowers-hearts, they are really beautiful! This is cutest thing ever! awww this is precious, i love it! Oh, so lovely for valentine! I want to try this design, it's so simple and sweet - just what I love! This is freaking cute! 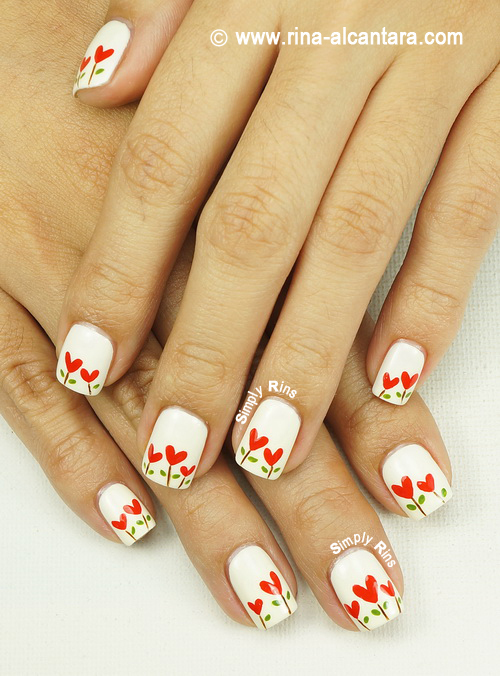 I love the 'planted' style :) This is going straight to my inspiration folder..
Beautiful nail art Rins! We would love to see more of your nail art on http://bellashoot.com.